If you are looking for cool paintball fields in Minnesota, then look no further then Splatball. Splatball is the Twin Cities’ premiere indoor paintball park. Groups and individuals alike are welcome, or call ahead to reserve a spot on our cool paintball fields for your next party or event. Walk on play is also available for groups of less than eight players. The experienced and friendly staff will set you up with safety gear, CO2, and compressed air. After that, let the game begin. Would you like to book a private party for a group? Splatball is Minnesota’s paintball party headquarters! 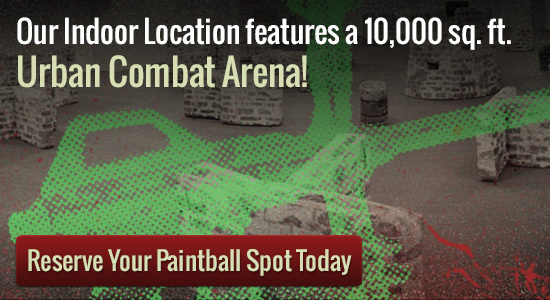 Our cool paintball fields are the perfect place to host your next birthday bash! Players of nearly any age can play paintball at Splatball. No need to bring your own equipment, we have full rental packages available with everything you may need to spend a fun and exciting day playing paintball. Splatball has a wide variety of games and scenarios to choose from. Groups of any size can book a paintball party at Splatball. There are also walk-on sessions available daily for individuals or small groups that would like to play with other players of similar experience. Reservations are not required, but are recommended for large groups or groups interested in play during a specific time. Please call us at 612-378-0385 if you have any questions or if you would like to reserve a time. Reservations can also be made through our online reservation system.